Peter Lynch, the manager of the Fidelity Magellan fund when that fund was delivering some of its best returns, said in one of his books that investors should always notice where they shop and what they buy. If they like a product, chances are that others do as well. This is, of course, just a starting point for investment ideas. But products you like could be made by great companies and some of those great companies could be great stocks. Based on recent news, that could be true for the company that makes popular shoes and boots that have held their popularity for many years. “Shares of footwear and apparel giant Deckers Outdoor surged after the company released better than expected third quarter earnings. Deckers Outdoor Corporation is engaged in designing, marketing and distributing footwear, apparel and accessories for both everyday casual lifestyle use and high performance activities. The company’s lineup of brands includes UGG, HOKA ONE ONE and Koolaburra. Third-quarter net sales rose 7.8%, hitting $873.8 million, up from $810.5 million during the same period last year. Operating income for the quarter came in at $244.7 million, up from $193.2 million last year,” Deckers said. Deckers now expects 2019 earnings to come in between $7.85 and $7.95 a share. That’s up from 2018’s $5.74 a share and considerably higher than the consensus number of $6.91 of analysts surveyed by Zacks. “With third quarter results delivered and an updated outlook for the full fiscal year 2019, I am pleased to say that we are now well ahead of schedule to deliver on the long-term strategic goals we laid out two years ago,” said Dave Powers, Deckers’ president and chief executive officer, in a press release. This news pushed the stock above an important resistance level. As with the ownership of any stock, buying DECK could require a significant amount of capital and exposes the investor to standard risks of owning a stock. 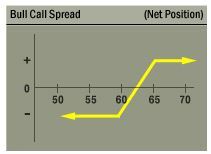 For DECK, the February 15 options allow a trader to gain exposure to the stock. A February 15 $145 call option can be bought for about $2.40 and the February 15 $150 call could be sold for about $0.80. This trade would cost $1.60 to open, or $160 since each contract covers 100 shares of stock. For this trade in DECK the maximum gain is $3.40 ($150 – $145 = $5; $5 – $1.60 = $3.40). This represents $340 per contract since each contract covers 100 shares.